I’m so excited to share this post with y’all! First, because of this epic recipe. 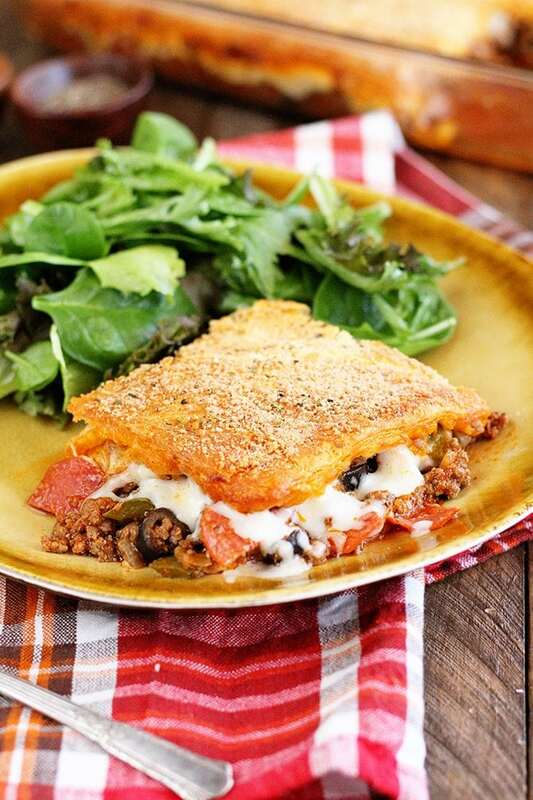 This Upside Down Pizza Casserole is going to be a new family favorite. Seriously. My family just loved it. 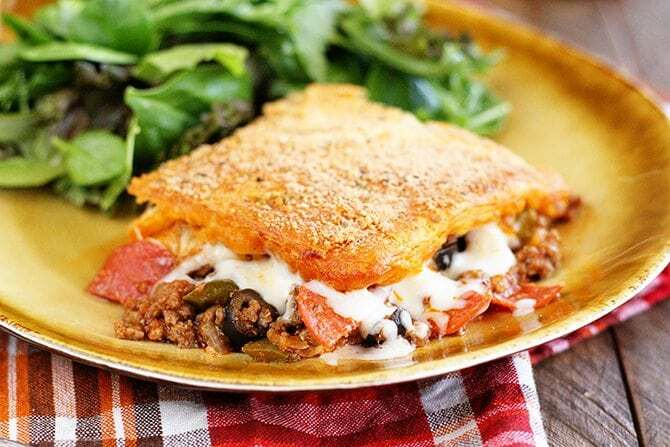 It’s a casserole filled with all your favorite pizza toppings then topped with gooey cheese and a crispy, flaky crust. Did I just say crispy, flaky crust?? LOL! If you have no idea what I’m talking about, click here. That video makes me laugh every time I see it. Anyway… It’s great too because you can add in whatever your favorite pizza toppings are. I tested a few different variations and found this one to be my favorite, but you’re welcome to take out the olives and add mushrooms. Or take out the green pepper, etc. You get the idea. It’s versatile. 🙂 And while it takes just a few minutes to put together, it’s super easy and amazingly delicious. The other reason I’m stoked about this post is that little baby right up there. 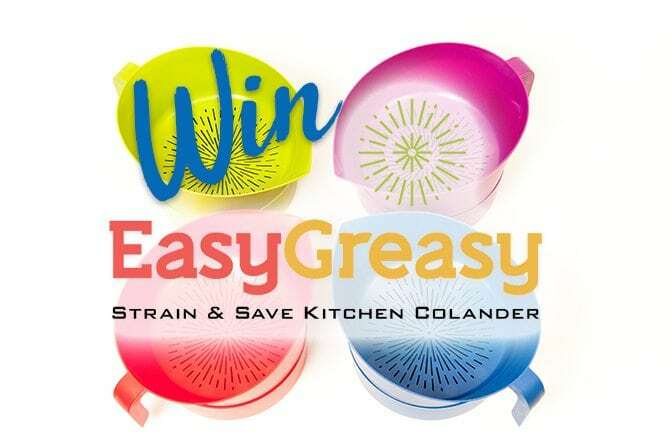 The Easy Greasy Strain and Save Kitchen Colander. So, we all know that it’s super bad to pour grease down our drains. It clogs up the pipes and eventually costs the municipal water folks some serious headaches. But I know some folks that still do it when they’re browning ground beef. 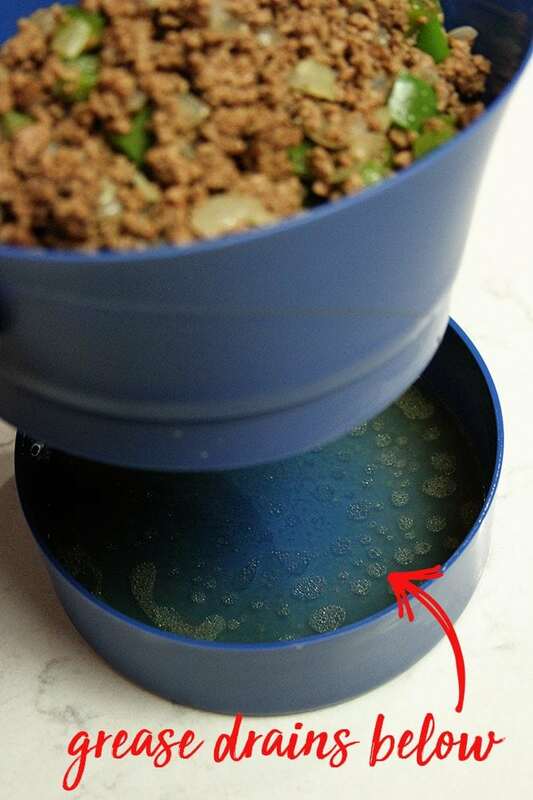 Because it’s so much easier than finding the right size colander and bowl, draining the grease into a bowl, allowing it to cool, then scraping it into the trash. But you shouldn’t do it. Our situation is even more complicated because we live out of town a little and have a septic tank rather than sewer service, so we can’t get ANY grease down our drains. After we moved into our house, I started looking for an easy solution to that problem. I found the Easy Greasy. 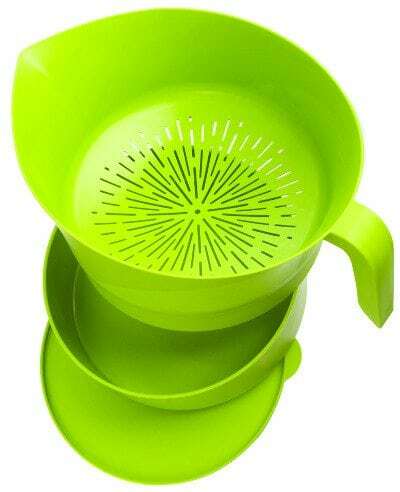 It’s a perfect little strainer that has a bowl that it fits onto so you can drain the grease away easily; that bowl even has a lid in case you were wanting to save the drippings like bacon fat or something. The perfect design allows the grease to drain away without the meat getting clogged into the little circular holes in traditional colanders. It’s also the perfect width to allow you to pour into it without stuff going everywhere. It’ll hold as much as 3 pounds of ground beef! I’ve used it for years and have even bought a few for family and friends as gifts. Y’all have probably seen me rave about it on social media before. Now, fast forward a bit and here’s me getting an email from Michelle, the inventor of the Easy Greasy. For real. I’ll admit it. I was totally fan-girling. And she reads Southern Bite! How cool is that? You hear of folks going all crazy for movie stars and I’m over here getting the vapors for the gal that invented my favorite kitchen tool. Ha! Michelle was a busy mom with limited cooking skills that used a lot of ground meat in her meals for things like tacos and meat sauce and was always searching for a way to deal with the excess grease. When she couldn’t find something like she wanted, she just invented it! Talk about goals and ingenuity! So Michelle wanted to share a little love with the Southern Bite family, so she’s giving away 10, count ’em – TEN, Easy Greasy Strain and Save Kitchen Colanders to 10 lucky Southern Bite readers. See the details and the end of the post to enter. 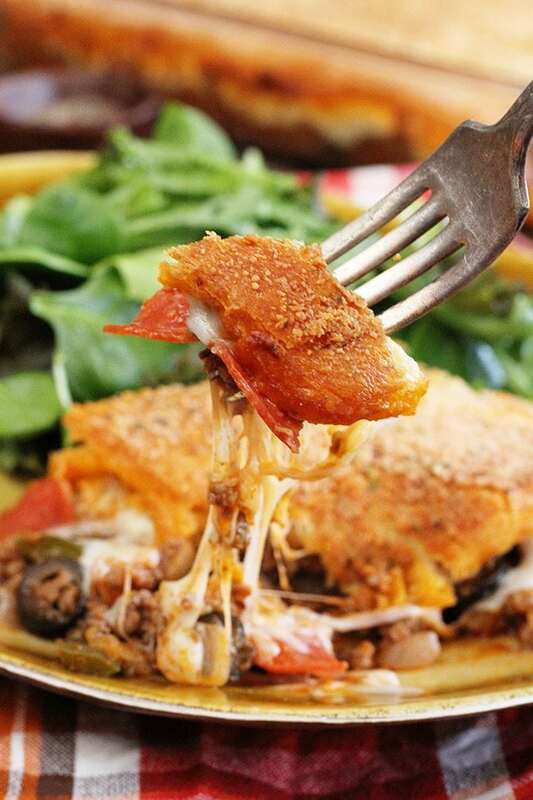 Now, this Upside Down Pizza Casserole is the perfect recipe to test out your new Easy Greasy. I used mine making it and you can too! It’s gooey, gooey comfort food perfection. The recipe calls for you to use a tube of crescent rolls which works perfectly. If you can find the crescent roll sheets in the can, you can use that too. In fact, that makes the process a little easier and a lot faster, it’s just not everyone can find those. Another thing to keep in mind here is that the flavor and quality of your pizza sauce will really affect the finished product. 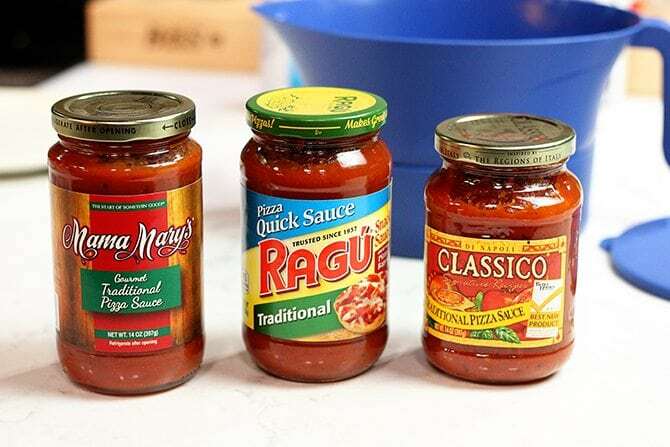 I tested 3 brands available at my local grocery store and found that, while they were all good, the Ragú had the best flavor without being too sweet. If you like a sweet sauce, the Classico might be just perfect for you. The crescent dough has a little sweetness, so I found the others making the whole dish too sweet. Again, any will work, the flavor will just be different. Now go make some! Y’all enjoy! 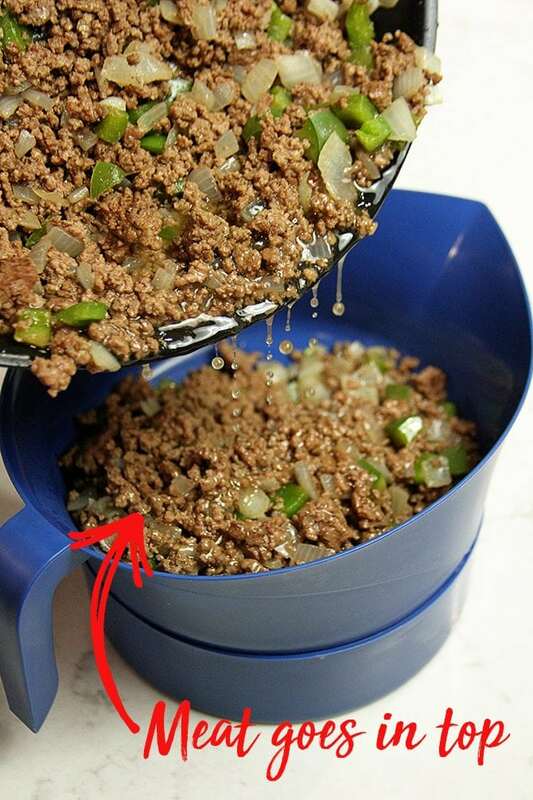 In a large skillet over medium-high heat, brown the ground beef with the pepper and onion. Once the meat is cooked through and browned, add the garlic. Cook for an additional minute or so. Drain the excess grease away. Return the meat mixture to the skillet or a large bowl. Add the pepperoni, olives, and sauce. Stir to combine. Pour the meat mixture evenly into the prepared dish. Sprinkle the cheese evenly over the meat mixture. Open the crescent rolls, but do not separate them. Lay the dough, in one sheet, on top of the cheese. Pinch the seems together and then carefully stretch the dough to cover the top of the casserole. Brush with the melted butter, then sprinkle with the Parmesan cheese and Italian seasoning. Bake for 20 to 30 minutes or until the crust is deep golden brown. Allow to rest for about 5 minutes before serving. 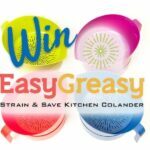 My friends at Easy Greasy helped to make this post possible by offering up the amazing giveaway. Opinions are all my own. Stacey, this looks so good. I am married to “The Ground Beef King” and anything that has ground beef in it is his favorite thing to eat! LOL. I will certainly be giving this a try. Thank you for sharing the recipe. I sure hope you’ll enjoy this one!! Thanks for having an easy question to enter! lol Your Upside Down Pizza Casserole recipe sounds really good. I think we’ll be having it soon. This looks good. I learned from my father to line an old pie tin with foil and then put it into a storage bag once it is solid. I never get people who put it down a drain.